Feeling a bit prickly? The cactus craze has taken over, and we're not complaining! 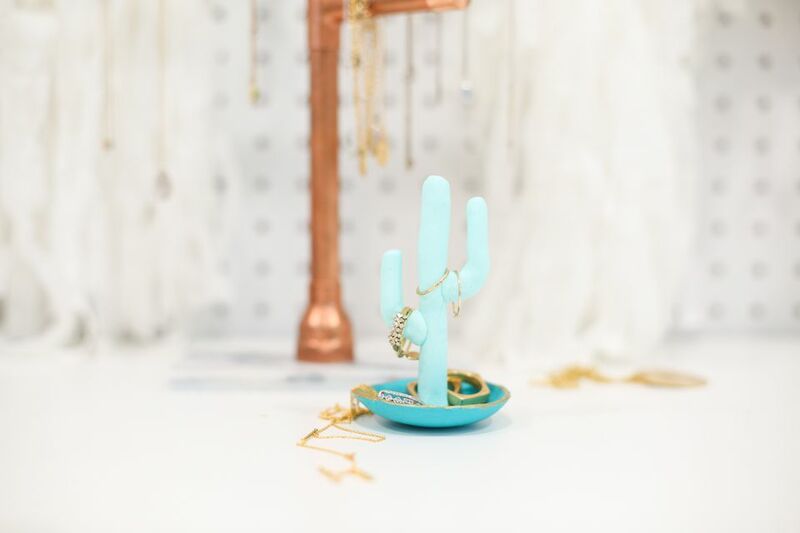 This simple project is a great way to incorporate the saguaro shape into your every day, in a way that's both fun and functional. Even if you're a novice at working with modeling clay, you can tackle this easy-to-follow DIY in no time. When you're finished, you'll have an adorable little spot to hold all of your most precious accessories. Make one for yourself, and then a few for your friends! Bring together all of your materials. Before you begin, preheat your oven to 230 F. Wipe down your surface to be sure it's free of any dust or debris, so that your cay stays clean. Work a small amount of clay in your hands until it becomes soft. Use the smooth water glass to roll it out to about 1/8" thick. Use the same water glass like a cookie cutter to cut out a circle from the clay. Set aside the excess clay. Smooth the edges of the circle with your fingers. Work another portion of clay in your hands until it is soft. Roll it out into a long section about 1/2" thick. Separate a section that's about 4" long, and two sections that are each about 2" long. Create a bend in each of the smaller sections to look like cactus arms. Gently connect them to the longer section by pressing them on and working the clay together. At the bottom of the cactus, flatten the clay so that it will stand level. Place the clay circle into a small, oven-safe bowl. It should be sized so that the bowl creates a curve in the sides of the clay circle as it bakes, making it into a small dish shape. Put the bowl and the cactus onto a baking sheet and bake at 230 F for 30 minutes. Remove the pieces from the oven and let them cool. Place a small amount of E6000 on the bottom of the cactus. Press the cactus into the center of the dish to spread the glue on both pieces. Remove the cactus for a minute to let the adhesive activate. Then press the cactus back in place. Hold for approximately 2 minutes. Once you let go, the cactus should remain upright. Allow the glue to dry thoroughly with the ring dish in a safe place. If you like, add a golden touch to the rim of the dish. Use a small paintbrush with gold paint to paint on a gold ring. Fill the ring dish with your favorite baubles and enjoy!